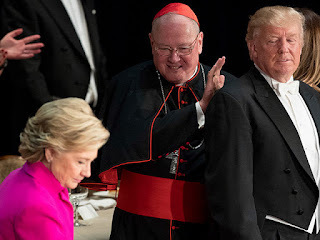 Catholicism for Everyone: "Here she [Hillary Clinton] is tonight, in public, pretending not to hate Catholics." "Here she [Hillary Clinton] is tonight, in public, pretending not to hate Catholics." Donald Trump blasted Hillary Clinton last night at the Al Smith Memorial Dinner. The last time the two candidates meet on the campaign trail before the election in November. We’ve learned so much from WikiLeaks. For example, Hillary believes that it’s vital to deceive the people by having one public policy and a totally different policy in private. That’s okay. I don’t know who they’re angry at Hillary, you or I. For example, here she is tonight, in public, pretending not to hate Catholics. What is Trump referring to? Wikileaks revealed a string of emails from the chairman of Hillary Clinton's Chairman John Podesta to John Halpin, former Democratic Strategist and Jennifer Palmieri, Hillary Clinton's Director of Communications. In them, they bash Catholics. From: Halpin, To: Jennifer Palmieri and John Podesta:Excellent point. They can throw around "Thomistic" thought and "subsidiarity" and sound sophisticated because no one knows what the hell they're talking about. Jennifer Palmieri wrote:I imagine they think it is the most socially acceptable politically conservative religion. Their rich friends wouldn't understand if they became evangelicals. John Halpin:Ken Auletta's latest piece on Murdoch in the New Yorker starts off with the aside that both Murdoch and Robert Thompson, managing editor of the WSJ, are raising their kids Catholic. Friggin' Murdoch baptized his kids in Jordan where John the Baptist baptized Jesus. You can just see the vitriol being spewed by these people, the highest officials in the Clinton presidential campaign. Pretty much any Democrat, especially party officials who claims to be Catholic is so in name only. They are ardent defenders of abortion right up to moments before birth. Plus, it seems fine at Democratic gatherings to openly mock Catholics. Later, one of the emailers stood by his comments and refused to apologize. Somehow his explanation is that he was just reacting to news that Rupert Murdoch had baptized his children in the Jordan river. Yes, I can see why he was so triggered by this! Makes perfect sense! He wants people to believe that the Clinton staffers involved in the email chain really respect Catholics. Give me a break!